Since my first call was past curfew and I received a gentle, but firm rebuke by her mother for calling so late, I had to figure out another way to contact Anita Kelley. Exactly 18 years ago today, I made my move. 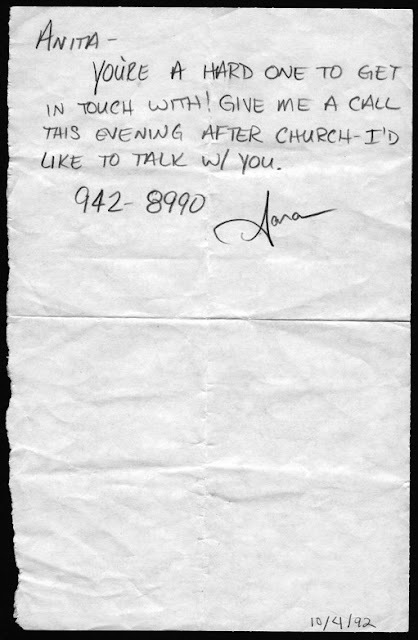 This is the actual note I sent to Anita through a mutual friend (she's kept every single note I've ever written). 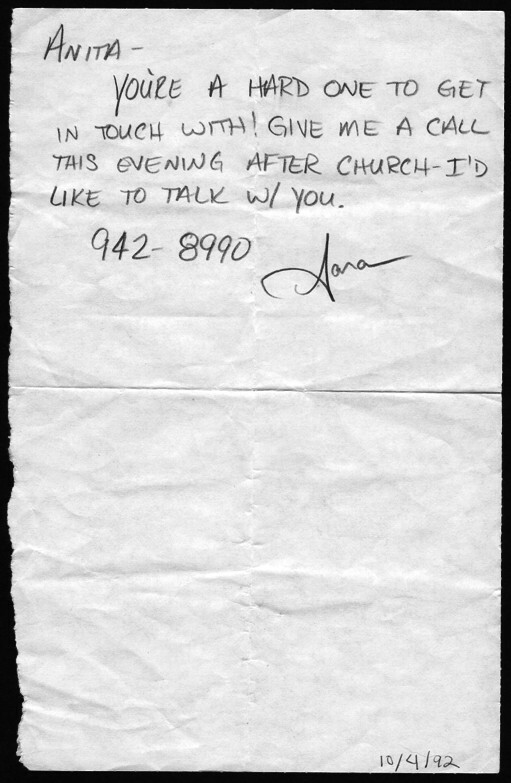 This note represents the first time I ever communicated with her in showing my interest. This is the first time I ever wrote her name. I was waiting at home, reading my Sam Walton biography and eagerly watching the clock. I knew she got out of church at 8:00pm and around 8:15 - just the amount of time she needed to drive home - she called. Four hours later I hung up the phone having just discovered my best friend. I've never been the same since. This is so cool! The date at the bottom of the note is literally the day after my wife and I were married... October 3, 1992. Our first date was October 5, 1984. How 'bout that!? Happy Belated Anniversary Brian! We actually met working at a movie theater together as teenagers. The first week of October must be a good time for getting to know someone. :) It's a special time of year for us because of our anniversary, our first date, and our first son was born October 4th a couple years after we were married. I love this time of year for most of the same reasons you do. Seems like we continue to have more in common. And the note... Anita has ALL the notes I gave her. Fall has always been my favorite time of year... so, it all worked out quite well. Yeah, we do have quite a bit in common. :) I think that's pretty neat that you first started talking with your wife exactly the day after we were married. I remember that day very well... we were flying to Florida for our Honeymoon at Disneyworld.